Newest member Jeanne Tomlinson and her husband Everett are members of the 2nd Kentucky Confederate States Calvary Unit. This is a group of about 70 members who perform Civil War conflict reenactments. Mr. Tomlinson is a Sergeant Major and has been in movies and commercials portraying a Civil War confederate soldier. What would you expect 10 women and 3 men to be doing at 8:00 am on Memorial Day? Well of course, the same thing that many of them having been doing for the past 25 years, going to Artesia Cemetery and making and placing flower bouquets for the 53 Civil War Veteran’s buried there. This has been a labor of love for our group and we will continue doing this task for as long as possible. Each year we get new members to help and participate. Many of the flowers are from the gardens of members, They have a production line first laying out the ribbon for each bouquet and then placing the flowers. The cemetery had already marked those gravesites for us to put the flowers on. This year we had a special treat added to the program that the Artesia Cemetery Commission presents. Our newest member, Jeanne Tomlinson and her husband Everett are members of the 2nd Kentucky Confederate States Calvary Unit. This is a group of about 70 members who do Civil War conflict reenactment. Mr. Tomlinson is a Sergeant Major and has been in movies and commercials portraying Civil War confederate soldier. He was part of a group who participated in the 150th anniversary of Gettysburg. Jeanne just joined our club in April and is already becoming an active member. 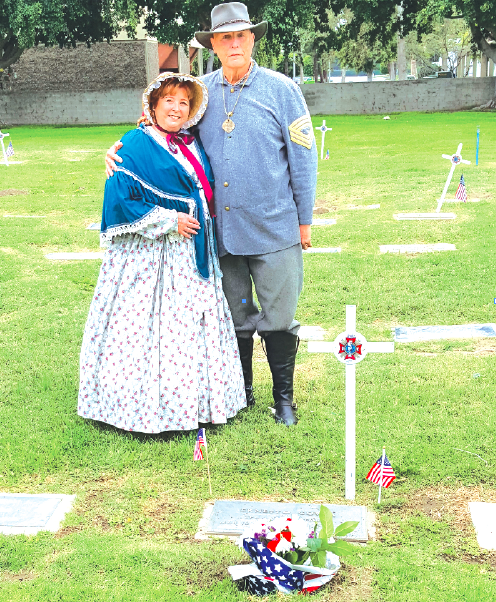 They both dressed in Civil War period attire at the ceremonies; where Mr. Tomlinson was the keynote speaker talking about the history of Memorial Day and the Civil War. The President of our club, Katherine George Chu also delivered a speech on the Woman’s Club and what we do in the communities of Artesia and Cerritos. It is such a meaningful day and one that we all go home from thanking those who served our country and gave of their live, and to those who came home to us safe and sound. God Bless the USA.